By David Ponce on 05/01/12 • Leave a comment! We’re in the running for headline of the year award. Let us know how we’re doing. There’s a number of things you can place atop a table, from flowers to a delicious stack of crisp bacon. And while our hearts belong unequivocally to the bacon, we kind of like the look of the above Accenda Freestanding Fireplace. 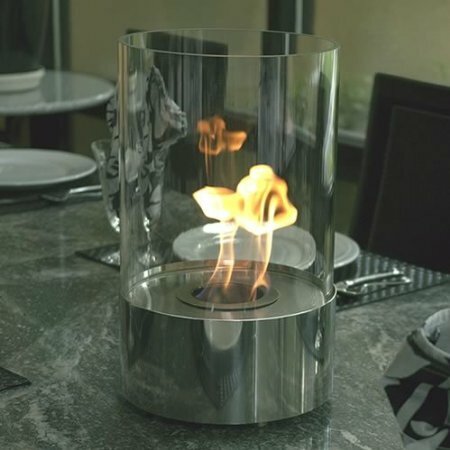 With a reservoir of 4 litres of ethanol, the clean burning flame can brighten up any dinner, while allowing itself to be transported easily into another room thereafter. The tempered glass enclosure won’t shatter from the heat. It weighs 17lbs and measures a very reasonable 9 x 10 x 15 inches. Tabletop fireplace fun can be yours for $129.